Millions of people are at risk of losing food assistance in the ongoing government shutdown. Experts say funding is expected to run out next month for food stamps, meals and nutrition for pregnant women and children. The USDA says children will continue to be fed breakfast, lunch and after school meals through February. 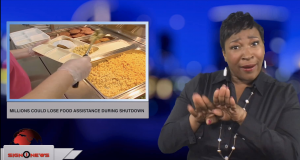 It’s unclear what other steps will be taken to assist low income families with groceries if the shutdown continues past when funding is available.